The Benvenue grill in Rocky Mount. Photo by Dudley Marchi. Dudley had initially thought to only write an article, but through a snowball effect, he continued to find more information. Marchi’s interest was sparked through his own connection of teaching French for 25 years, and he felt French was a missing part of North Carolina’s history. Many people may be unaware, but the French were the first to explore our coast in 1524. King Francis I of France hired the Italian explorer, Giovanni da Verrazano to find a sea route to the new world. Verrazano reached the coast of N.C., what would now be Pine Knoll Shores. He named it “Tera Francesca” (French Land). It wasn’t until the 1690s and early 1700s that the French Huguenots, a religious group, migrated to N.C. because they lost their religious freedom through Louis XIV’s Edict of Fontainebleau. With a large population of ministers, merchants, craftsmen and physicians leaving France, the country suffered a huge loss. However, the French Huguenots brought important influences and ideals that have become a part of American values: religious freedom, individual rights and personal liberty. 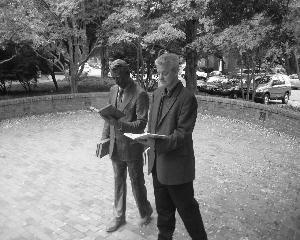 Dudley Marchi next to the statue of William R. Johnston at the Monroe Evans Gardner Arboretum, NC State University campus. Photo courtesy of Dudley Marchi. There was a group of French Huguenots who migrated from Manakin Town, Virginia, in 1704, but as there has been no evidence of physical presence, historians have called this group the “lost French colony.” This French colony was not really lost like the Roanoke colony, but it assimilated into the dominant English populace. Early settlers included people from all over Europe such as the Welsh, German, Swiss and Scottish, but with the largest stock of settlers being British, the minority groups had to assimilate to survive, including the French. In New York city, there are the neighborhoods of Little Italy and Chinatown, so why couldn’t there be similar towns here in North Carolina? The answer: there just wasn’t enough of each group in North Carolina to maintain these types of neighborhoods. As years passed, the French, along with other groups, slowly lost their language and culture through generations of intermarriage. The United States’s sentiment on France has been one of mixed feelings. While founding fathers such as Benjamin Franklin and Thomas Jefferson were open to the French helping us during the American Revolution, John Adams and Alexander Hamilton were skeptical as they believed the French had their own motives to control the colonies. The truth is America would not have won the American Revolution without France’s help, but America and France have always been in an ambivalent relationship even in recent years. The two countries have their disputes when it comes to political matters such as the invasion of Iraq, but Americans admire the French with millions of Americans visiting the country to take in the culture and language. Many people may be unaware, but Blackbeard, a pirate who often did business in North Carolina, spoke some French. “His French wasn’t fluent, but he could get along in pirate French,” Dudley noted. Being a pirate/merchant, Blackbeard did his business with many people, including French merchants, so he picked up French in order to converse in the business. In his personal life, he had a common law French wife. He hung her after finding she cheated on him with a local boy. Some people say that the wife’s pleas can be heard sometimes in the wee hours in English and French. Through the widespread history of North Carolina and French history, there has always been the outlet of the arts for writers and artists to represent the times. Dudley has been teaching French history and culture in classes such as Art and Society in France and Masterpieces of Western Literature. With his degree in comparative literature, he believes the arts are interrelated. “If I’m teaching a certain literary work, it really helps to bring in paintings and architecture of the period because some students are visual learners,” Dudley explained. A literary work or the politics of the time may help to explain a painting, and a painting may be a portrayal of a period in a time. By knowing how each goes hand in hand, students are able to make connections between the history and the arts.